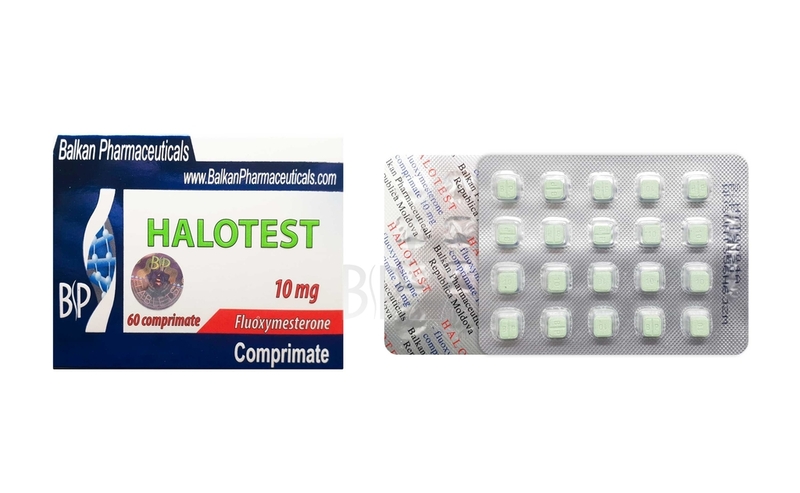 Halotest is an anabolic steroidal oral drug with the active substance of fluoxymesterone that has an androgenic origin. The concentration of fluoxymesterone in the drug is 10 mg/tab. Halotest contributes to the increase of strength indices, improves and stresses the relief, gives out the veins and at the same time has a significant fat-burning effect. Aggression increase is noted at the sportsmen during the administration of the drug. Anabolic activity of the drug is 2000%, androgenic one is 1000%. After being applied the drug keeps its activity during 5-10 hours. Its traces in sportsman’s body may be found during two months after the cessation of the drug. By the way, you may get the confirmation of the quality of this drug from Balkan according to the UPIC number that is printed on the blister. In order to perform this, please, visit the website www.b-p.md. Halotest, whose description may be found on our forum, increases the qualitative and not quantitative characteristics of the musculature. That is why it ideally fits for those sportsmen who want to achieve the increase of the results without passing to higher weight category. When the drug is administrated the muscular strength observable increases. This gives the sportsmen the possibility to achieve such results that seemed to be unachievable. And all this happens in a short period of time. Thanks to its ability to increase the strength together with the increase of aggression during the administration of the drug it is very popular among the representatives of different kinds of combat sports. The features of Halotest tablets is to increase the strength and better the quality of muscles in the shortest possible time makes this drug one of the most demanded during the precompetitive preparation period. However, the strength and aggression help to win also in many contact kinds of sports, for example, rugby and hockey. In bodybuilding, Halotest is used mainly before the competitions. Together with the increase of strength indices it helps quickly create beautiful relief, increase the density of the muscles and effectively “dry”. When included into the course, Halotest doesn’t contribute to muscle growth alone. It discovers the reserves of muscle performance. Qualitative characteristics of the musculature are increased – strength, endurance and beauty which is especially valuable before the competitions. But in case you want to buy Halotest for often use, then you should reject this idea. Positive reviews about Halotest may be heard from the representatives of different kinds of sports. First of all, from the representatives of those kinds of sports where strength, speed and also “sports aggressiveness” are estimated. In order to learn the reviews about Halotest, visit our forum. Here you can learn the opinions of experienced sportsmen and also actively take part in the discussion of the drug. In case you don’t find the answer to the question that interests you – you can create your own topic. In case you know its affects, not hearsay – leave your review about Halotest drug, your experience will be useful for many beginning athletes. Depending on the sports targets the duration of the course may be 2, 4 or even 6 weeks, but not more. At the same time, the daily dose may be set up within quite large range: from 5 mg to 40 mg. For the stimulation of muscular mass growth combinations with Nandrolone and also with different esters of testosterone. Due to high hepatotoxicity of the drug it is rarely used in bodybuilding. Usually, the course of Halotest is applied exclusively in the precompetitive period. For regular current workouts more “sparing” drugs are used. Beginning athletes are not recommended to use the course of Halotest; in order to perform this course it is necessary to have the experience of analogous drugs administration, also knowledge about your own body’s reaction, the skill to correctly build the graphic of workouts, define the necessary dosage and frequency of administration are necessary. Otherwise, the tablets of Halotest may not give the expected effect. Meanwhile, this is quite an expensive drug in order to spend it “idle”. Besides this, the administration of the drugs without corresponding physical stresses increases the risk of side effects appearance. Beginning athletes are recommended to start the administration of the drug with minimal dosage. At the same time, the intervals between the administrations should be maximal. 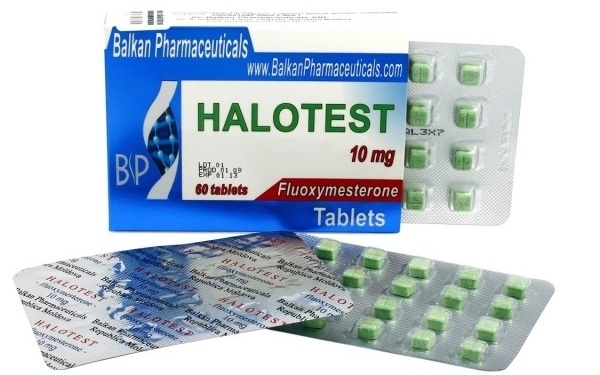 Halotest tablets may cause side effects which are mainly conditioned by its androgenic activity. Main outer side effects are acne and increased hair growth. During the course increase of libido, increased frequency of erections is possible. Much more dangerous are suppression of production of natural testosterone production, suppression of spermatogenesis, development of abnormalities of the prostate gland. Female athletes may suffer from possible vaginal bleeding, an increase of libido. Drug abuse threatens with significant cases of virilization. Also during the administration of the drug in excessive doses gynecomasty, edema caused by water retain and hair loss are not rare. Also nausea, dizziness, insomnia, aggression, anxiety, and other negative manifestations. One of the main dangers for the sportsmen of both sexes of any age who administrate Halotest is increased toxicity of the drug for the liver. That’s why if you suffer from liver insufficiency and other chronic diseases the administration of the drug is contraindicated.